Internal links are to backlinks what Robin is to Batman. They’re crucial to SEO success, yet receive little to none of the credit. What are internal links, I hear you ask? They’re links from one page on the same domain to another. Every website has them. But what most people don’t realize is that—when used strategically—internal links can significantly boost a site’s performance in the search engines. Traffic growth for ninjaoutreach.com during the period in which they actively worked on their internal links via Ahrefs Site Explorer. In this post, you’ll learn why internal links are critical to SEO success and how to create a smart internal linking strategy for your website. Google uses internal links to help discover new content. Let’s say that you publish a new web page and forget to link to it from elsewhere on your site. If we assume that the page isn’t in your sitemap, and doesn’t have any backlinks, then Google won’t know it exists. That’s because their web crawler can’t find it. Google must constantly search for new pages and add them to its list of known pages. Some pages are known because Google has already crawled them before. Other pages are discovered when Google follows a link from a known page to a new page. Pages with no internal links pointing to them are known as orphan pages—more on those later. Internal links also aid the flow of PageRank around your site. That’s a big deal. Generally speaking, the more internal links a page has, the higher it’s PageRank. However, it’s not all about quantity; the quality of the link also plays a vital role. Google axed public PageRank scores in 2016. However, PageRank remains a core part of their ranking algorithm. We know this because they said so. The number of internal links pointing to a page is a signal to search engines about the relative importance of that page. May deserve to rank for blue widgets and other relevant terms. Notice that I bolded the word “may” there? Just because your page is about a particular topic doesn’t necessarily mean that it deserves to rank for related keywords. Google also states that internal linking structure can affect sitelinks. Not a huge deal, but something to keep in mind nonetheless. Kind of, but that way of thinking can lead to low‐quality and unnatural internal links. Example of a low‐quality link shoehorned into a paragraph. You need to think smarter, and it all begins with your initial site structure. Think of your website as a pyramid with the most important content at the top and the least important content at the bottom. Most websites have the same page at the top of the pyramid—their homepage. Under that, they have their next most important pages—about us, services, products, blog, etc. Under each of those, they have slightly less important pages—individual products and service pages, blog posts, etc. But you shouldn’t link all pages on one level of the hierarchy to all pages on another. You need to keep relevance in mind. Siloing is the grouping together of topically‐related web pages via internal links. 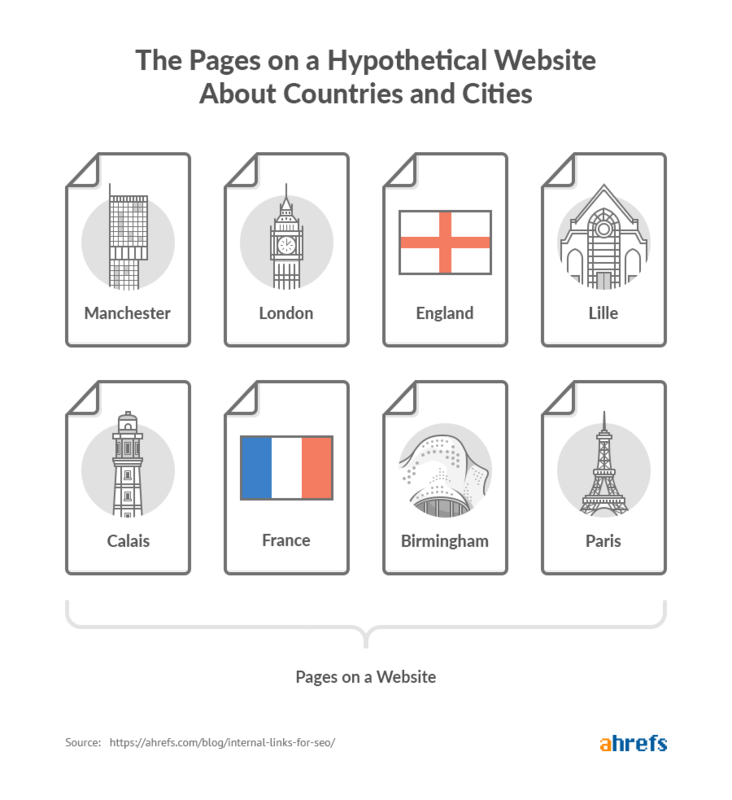 Each country page acts as a “hub” and links to subpages about related cities (and vice‐versa). This creates a topic cluster—a group of interlinked pages all closely‐related to the same topic. 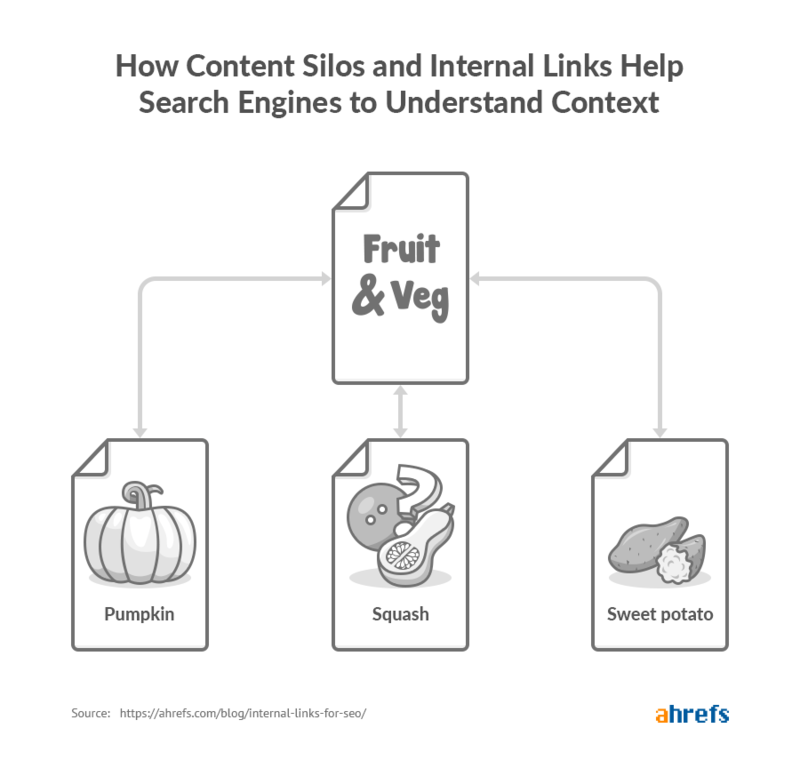 But there’s another, often overlooked benefit—this kind of structure can help search engines to understand the context of your content better. Is that page about butternut squash, or perhaps the sport, squash? Who knows? Another overlooked advantage of silo structure is that—because you’re linking to and from topically‐related pages—there usually are plenty of opportunities to do so using relevant anchor text. For example, it makes total sense to link from a page about fruits and vegetables to one about butternut squash with “squash” as the anchor text. You don’t have to shoehorn that link into an unrelated page as we saw earlier. Looking to learn more? Read Bruce Clay’s infamous guide to SEO siloing. Everything above makes sense. But unless you’re starting a site from scratch, things aren’t always as organized as you’d like. That’s why you should audit your existing internal links before adding more to your site. This isn’t as difficult as it sounds. 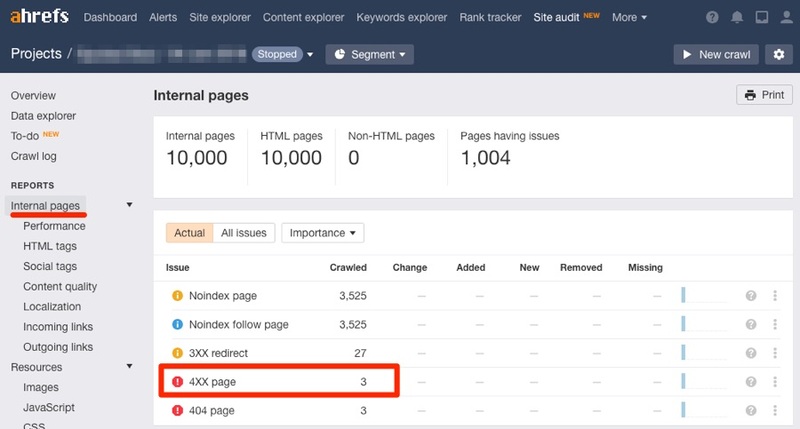 The first step is to crawl your site in Ahrefs Site Audit tool. There are ways to do some of the stuff mentioned below without crawling your site. I will mention these as we go along. However, if you’re an Ahrefs user, my recommendation is to set a crawl going to ensure that you have the freshest data to work with. This report shows you all broken internal pages on your site. These are bad because they waste “link equity” and result in poor user experience. I recommend sorting the “No. of inlinks” column from high to low to prioritize pages with lots of internal links pointing to them. Reinstate the broken page at the same URL (if deleted by accident). Redirect the broken page to another relevant URL. Update or remove all internal links pointing to it. If you’re opting for solution #2, you can see all the inlinks to the broken page by hitting the corresponding number in the “No. of inlinks” column. It tells you the referring page and anchor text, which makes it easy to find and remove/update them. Learn more in our full guide to finding and fixing broken links. Note. You should also sort by nofollow internal links. All broken internal links should be fixed. Just click on the number of internal links to see the actual links. Using Site Explorer instead of Site Audit is useful for when you want to see broken internal links on a third‐party website without having to run a full crawl. This report shows you all redirected pages (3XX) on your site. Sort by “No. of inlinks” (high to low) to prioritize the pages with the most internal links pointing to them. It’s important to note that not all of these will be issues. For example, if you have internal links pointing to moved and redirected pages (e.g., http://domain.com/blog → https://domain.com/blog), then it’s likely nothing to worry about. Either way, be on the lookout for pages that redirect to something not‐so‐relevant. That’s 20 internal links to a specific brand of shoes, which now redirects to a generic women’s footwear page. 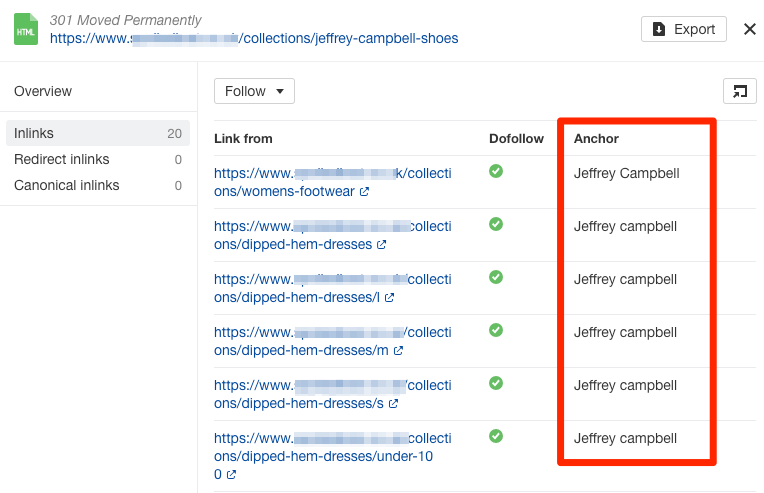 Even worse, if we click on the number of inlinks, we can see that the anchor text used for these links is “Jeffrey Campbell” (the name of the brand). That’s misleading, and those links should be removed or updated. You can also use Site Explorer to find redirected internal links. Note. Once again, you should also check and fix nofollow internal links. This report shows the working pages on your site. Sort by “No. of inlinks” (high to low), then start by skimming this list. If you see unimportant pages with lots of internal links, remove them. It may even make sense to delete those pages. This blog post is about what’s new in June. As it’s now January of the next year, chances are this page isn’t particularly useful or getting a lot of traffic, yet it still has 16 internal links. I would be inclined to delete this page and remove the internal links. You can also customize the columns and sort by the number of “dofollow” inlinks instead, which can be useful for filtering out things like login pages with lots of internal nofollowed links. Furthermore, if pages are set to “noindex, follow,” Google will equate them to “noindex, nofollow” in the long‐term. The result is an effective break in the flow of “link juice” through these pages, so it’s best not to internally link to them with “dofollow” links. This can also be done, to an extent, in Site Explorer. Note. There’s no way to see whether a page is indexable in Site Explorer. You would need to use Site Audit for that. This report shows the working pages on your site. 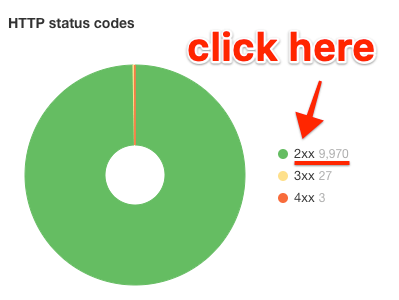 Sort by “Depth” (high to low) to see the pages that are the most clicks (link hops) away from your seed page—which will likely be your homepage. As a general rule of thumb, if you see any important pages—ones that earn you revenue, convert well, target a worthwhile keyword, etc.—more than three link hops from your homepage, then you may want to consider adjusting your internal linking structure to bring them closer. Google may deem “deep” pages to be relatively unimportant—so they may not recrawl them too often. Not always an issue, but something to keep in mind. 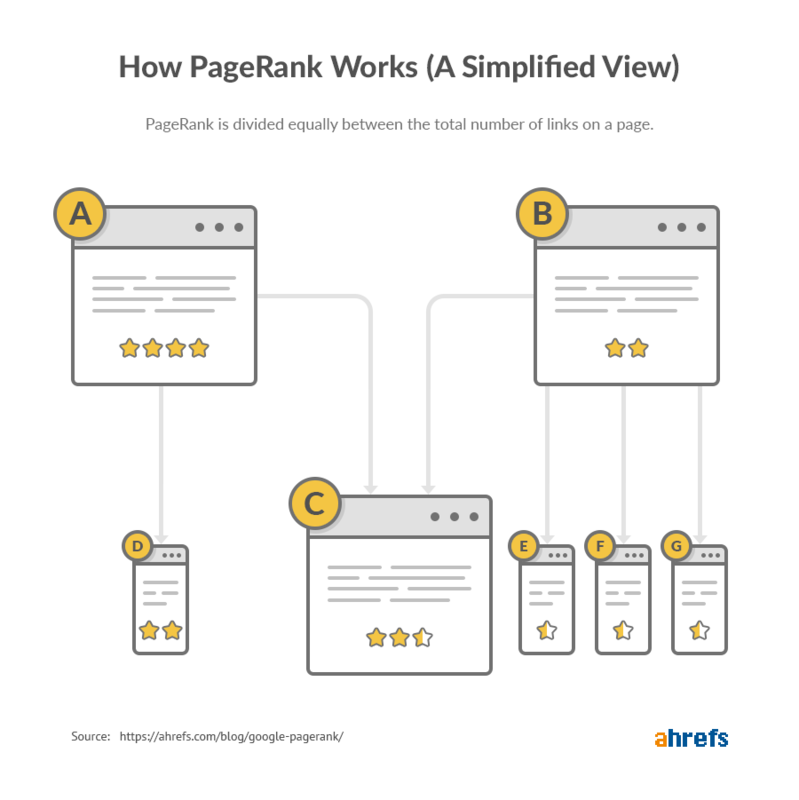 The most authoritative page on most sites is the homepage—the closer a page is to your homepage in terms of link hops, the greater the transfer of PageRank to that page. This report shows pages with no internal links, i.e., orphan pages. 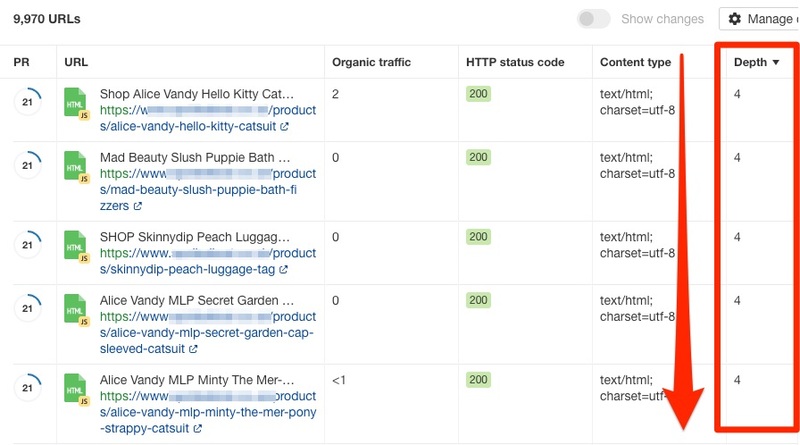 For this to work, it’s crucial that you either specify your sitemap URL or leave the “Auto‐detect sitemaps” box checked when setting up a crawl. If you opt for the latter, Site Audit will only be able to find your sitemap if it’s listed in your robots.txt file or located at yourdomain.com/sitemap.xml. Google won’t be able to find them (unless you submit your sitemap via Google Search Console, or they have backlinks from crawled pages on other sites). No PageRank will be transferred via internal links—as there are none. Skim the list and make sure no important pages appear here. If you have a lot of pages on your site, try sorting the list by organic traffic from high to low. Orphaned pages that still receive organic traffic would likely get even more traffic if internally linked to. Internal links aren’t the only means of increasing the authority (PageRank) of a page. 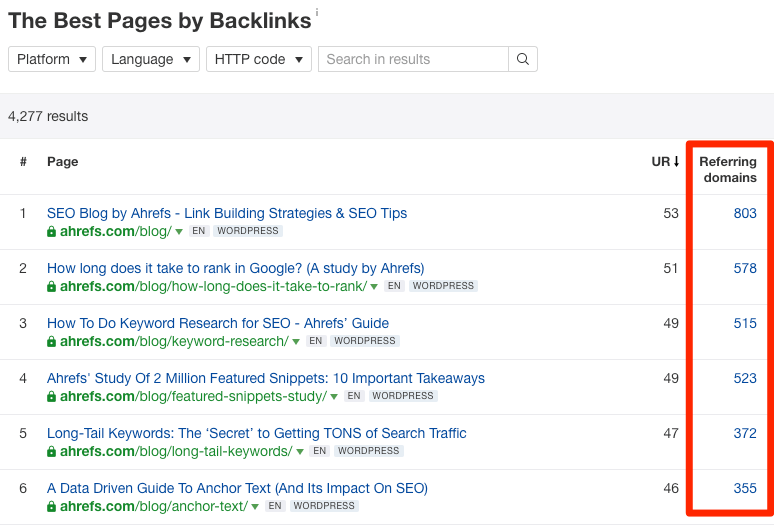 Backlinks also help. The pages with the highest authority—i.e., URL Rating (UR)—have tons of backlinks. Yes, they’re also part of our overarching site structure and have internal links, but it’s the links from external sources that give these pages their power. Internally linking from relevant, high‐authority pages to those that need a boost is a smart strategy. There are a lot of ways to do this, and the methods can get quite elaborate and complicated (spreadsheets, VLOOKUPS, etc.). So below, I’ll focus on two simple strategies that anyone and everyone can use. You want to add a few internal links to that page to give it a boost. But how do you know where to link from? This search returns pages on your site (in Google’s index) that mention a specific word or phrase. 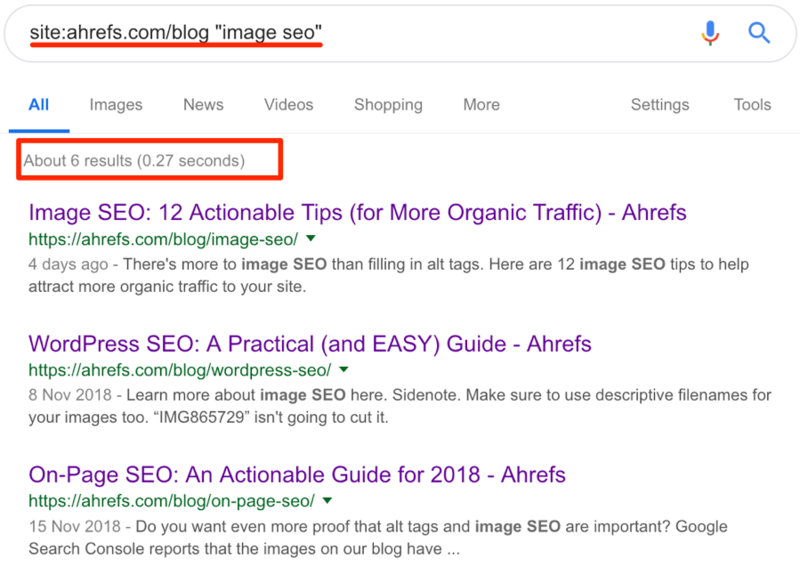 You can see that in this instance, the phrase “image SEO” appears in six of our blog posts, including our WordPress SEO guide. However, if you look at the page itself, you’ll see that those words are unlinked. Do you see where we’re going with this? That’s the perfect place from which to link to our image SEO guide with super‐relevant anchor text. That’s not the only place from which we can link either. There are four other pages also mentioning that phrase—excluding the guide itself. So we can quickly check out those places, and add links where relevant. Now, this process is fine as long as you have a small site—it didn’t take us long to check through six pages manually. If you have a larger site, however, and see a lot of results for your query, it makes sense to prioritize and add links from the most powerful pages. The first is to use Ahrefs SEO Toolbar to download the top 100 Google search results, complete with Ahrefs SEO metrics. You can then sort by UR to prioritize the most “powerful” pages. The second is to scrape the Google results using the Scraper Chrome extension (here’s the XPath to do that: //div[@class="srg"]/div/div/div/div/a/@href), then paste them into Ahrefs Batch Analysis tool. Sort by UR. Both methods achieve the same result. We go through this process every time we publish a new blog post. Your “power” pages are those with the most backlinks and authority. 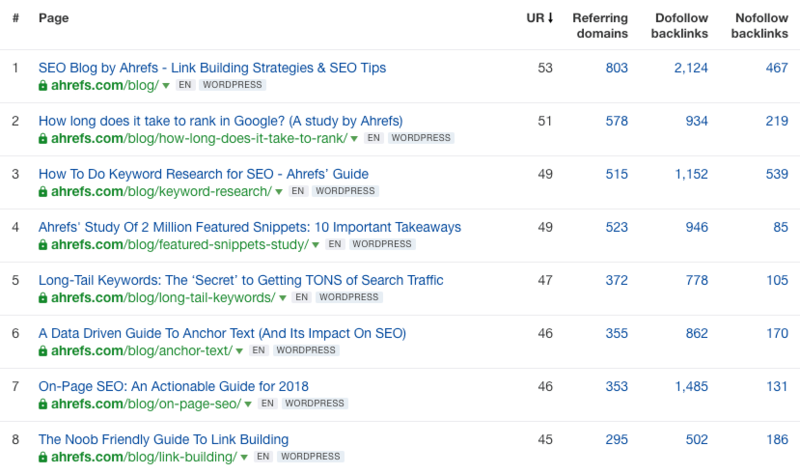 You can find these using the Best by links report in Ahrefs Site Explorer. Looking down this list, you can often find relevant pages and posts from which to add links. For example, our noob‐friendly link building guide is the eighth most authoritative page on our blog. That post happens to have a section on link building with images—something that I talk briefly about in our image SEO guide. This is another perfectly relevant and useful place to add an internal link to that guide. You can also use this method to direct some much‐needed authority to product and service pages. For example, say that you sell protein powder online. You’d probably want your ecommerce category page to rank in Google for things like “buy protein powder.” These types of pages can be difficult to build links to. But perhaps you have an authoritative blog post about protein powder or building muscle that you can add internal links from? Those internal links will boost the “authority” of your ecommerce category page. Internal linking isn’t rocket science. You simply need a logical, hierarchical site structure and for your internal links to follow that structure. That’s the basics, at least—you can then strategically link from your “power pages” to those that need a little SEO help. Don’t always use the same anchor text. Mix things up and keep it diverse. Don’t link from irrelevant pages only to boost authority. You’re better off not linking internally at all. Don’t overdo it. 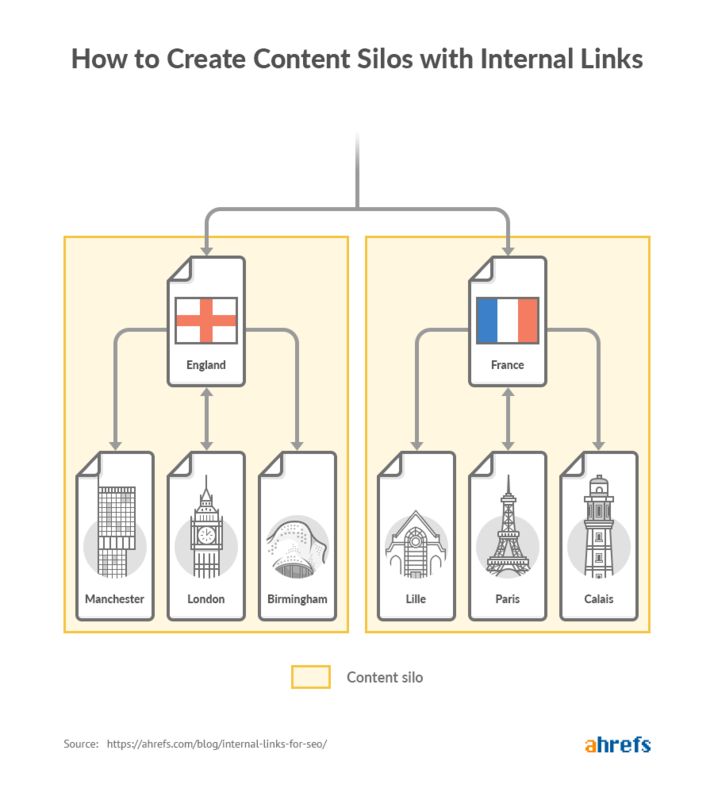 You don’t have to add hundreds of internal links for this to be effective—one or two well‐placed internal links can often make a big difference. As I said, it’s far from rocket science. However, if you’re in any doubt as to what to do, here’s my advice: spend an hour or two browsing Wikipedia. Their internal linking game is on point, and there’s a lot you can learn from them—even if you only run a small website.